When reading about good customer service examples, it’s very easy to dismiss them as flukes. Someone raves about amazing customer service they just received? The problem wasn’t probably that difficult to begin with. A friend recommends a service that offers near-instantaneous response rate? Well, the company probably has very few cases to deal with so it’s easy for them. However, every professional working in the customer service space knows that it’s never that simple. Planets do not simply align and conditions don’t just happen to be perfect to facilitate a quick resolution. What people often don’t see are the hours spent on developing, implementing and practicing the right customer service methods, tools and know-how. You make your own luck in customer service. If you want to tip the scales in your favor and produce good customer service results, see what skills, attitude and metrics you should follow. Here’s a very simple definition of good customer service: good customer service is about maximizing your ability to make the bad things that happen to your customers go away really quickly. There are two major factors that play a role here. First off, you want to solve every case as fast as possible. The longer a problem persists, the more of a nuisance it is for the customer. And you don’t want to provide that kind of experience on your website. Even if you can’t solve a particular problem in one touch, a fast response to the initial question with a promise of a solution later down the line is much better than the radio silence many companies seem to like so much. Secondly, you want to make the experience as enjoyable and professional as possible. This means that you should approach every customer equipped with tools and methods that will allow you to diffuse the situation and find a solution without giving PTSD to the customer. This means that agents working in customer service should be masters of social interaction, they should think quick on their feet and they should be able to magic a solution no matter the circumstances. Basically, you need a few double-o agents with a license to help. Just like this guy. Don’t worry though. You can have acceptable, or even decent, customer service by getting either one of those conditions sorted. For example, if the help comes quick, customers are able to forgive unenthusiastic attitude or dry reception. It works the other way around too. The solution may come a bit slow, as long as agents are able to leave an impression after delivering world-class service – the kind you would expect from the most expensive hotels or restaurants in the world. However, only by getting both pieces of puzzle right you can reach the Holy Grail of customer service: people wishing that something breaks down just to get the taste of your good customer service one more time. Sounds like something you’d want to achieve in your business? Here’s a few things you should keep an eye on when going for truly good customer service. The first step on the road to good customer service happens way before any chats or calls with customers and it’s about hiring the right people for the job. To provide good customer service, an agent needs the right combination of customer service skills and traits and knowledge of customer service best practices. You have two ways of making sure that happens: hiring and training. Both are equally viable and can complement each other well. For our internal purposes we use our own Customer Service Quiz for former and Customer Service Training for latter. The ￼Media Temple￼ recruitment process (more on them later), teaches us that it’s much easier to hire for the right customer service traits and train for skills than the other way around. For example, if you have someone with a very deep understanding of a certain technical aspect, e.g. a programming language, but they also lack empathy, it would probably be easier in the long run to hire someone with a lot of empathy and teach them the programming language. In other words, a good character fit is probably more important than having all the skills when hiring. Whenever you get an application from someone that has both the skills and the traits, it’s an early Christmas present but more often than not you will have to choose. My advice here is to pay extra attention to traits during the interview/trial period and facilitate customer service training opportunities for the necessary skills later down the line. What is the last skill you learned and how: This question can show you if you are dealing with a learner or not. If they can answer the question quickly and get really passionate about the described skill, you may be dealing with someone that not only likes to learn new things but also can do it really fast. How would you deal with a partial refund situation: This is the Kobayashi Maru of customer service – a situation without ‘the correct’ answer. It requires the candidate to deal with suboptimal conditions where they can’t give the customer everything they want and it shows how they deal with stressful situations. Teach me how to use your favorite app: More of a task than a question, but it shows you how the candidate would approach a customer service situation with a product they already know inside and out. Communication skills: The candidate needs to know how to communicate ideas in a simple, easy to understand way. They also need to be aware of the type of customer they are dealing with and adjust their approach accordingly. For example, an enthusiastic and informal answer simply won’t work for a formal and annoyed customer, even if it’s correct. Resourcefulness: The ability to find solutions where there are no easy answers and deal with problems when you don’t have all the information or tools available to you. The ability to work in a team: The bigger a customer service department is, the more important this will become. This covers both the ability to work well with others as well as knowing who can solve specific problems. Imagination: There will rarely be clear-cut cases when agents know everything about the customer or their problem so it’s important that they are able to fill in the blanks with the most probable conditions. This takes a certain degree of imagination. It also definitely helps when trying to cook up more unorthodox solutions to difficult problems. Honesty: You know what’s way worse than a business that is not able to help you? A business that is not able to help you and will lie about it. If something can’t be done, or you made a mistake, you should own it. Customers appreciate honesty, especially when something doesn’t go as planned. Responsibility: Agents should feel responsible for the success of the customers. They should go out of their way to help them and suggest the best course of action for the customer. Instead of being a 3rd party, they should act as if they were advisors to the company. This seems like a no-brainer but many businesses still go for the old ‘profits first, customers second’ approach. And that’s simply not how a modern customer service should be run. Even if you stand to save a bit of money by denying a customer free shipping or a refund, you will lose in the long run. Here’s a thought for businesses that don’t place much value in their customers satisfaction when it requires some sacrifices: think how much an average customer spends in your shop when everything goes right. This is the LTV (life-time value) of the customer. Let’s say that the average LTV of your customers is $200. If a customer asks for a refund that sets you back $30, it simply doesn’t make sense to deny that request because instead of saving $30 you will miss out on the remaining $170. And that doesn’t even include all the additional business they can bring through word of mouth after telling their friends what kind of amazing customer service they received. In the long run, staying on the customers’ good side and helping them no matter the costs will be much more profitable. The way you see your customer service is often quite different to the way your customers see it. Businesses often forget that the channels they’ve set up will be used by customers to get help. In the eyes of the customer, the channel they like the most is the channel they will use to get something sorted out. It won’t matter for customers that you use chat for support and phone for sales. They ask support questions on both channels and you need to be ready for it. Far too often a business will set up a dozen of channels like website, chat, phone, email and various social media profiles but will offer help on only a few of them. It’s as if someone with a broken leg came to an ER room only to find a card stating “we’re in the hospital on the other side of town.” Definitely not something you want to experience as a customer. The majority of this multi-channel customer service opportunities are wasted on social media. Businesses set up profiles and fan pages with the intention of grabbing extra reach and clicks and simply forget or, even worse, ignore customers asking questions there. If you’re not sure about the whole concept of multi-channel customer service, try walking in the customers’ shoes for a while. They don’t know that they can get help on your website via a knowledge base or by calling you. They don’t know the address or the phone number. What they do know is that they can type in your company name on Facebook and post a quick question there. You can’t simply tell them to call you (or at least not in all situations). There’s also the additional effect of bad reputation. The longer such question stays up unanswered, the worse it will look. The only solution is: when you decide to go for social media, be ready to answer all kinds of questions there, especially those concerning support. The speed at with which your customer service operates plays a huge part in creating an amazing experience. You can really do a lot in terms of customer delight and keep falling short if you don’t add speedy responses and resolution to the mix. And it’s not just an opinion but a fact supported by hard data. When preparing our Customer Service Report, we found out that you can see a clear correlation between the speed of response and customer satisfaction (CSAT). The faster your responses are, the higher customer satisfaction you can get. What does this mean for your business though? How do you speed up your customer service? You should think of all the things that keep pulling you down and improve them, one by one. First of all, in all types of online customer service, the typing speed of agents will be the deciding factor. There’s no single skill worth developing more than the typing speed. Typing speed is the raw horsepower of your customer service. Even though it requires some extra finesse like good communication skills, problem solving skill and other things, you can’t go far without it. Fast typing will help even in situations when you don’t have an immediate answer. When getting that quick, initial response, customers don’t have to wonder if their question went through or if someone is working on it. In other words, the faster you type, the faster you can help. To get better at typing, you need to start with a typing speed test to see what you can already do. Tests like this can also be used in the recruitment process to provide some extra data about the candidate. Once you know how many WPM (words per minute) you can churn out, you can start practicing typing using various training programs. Using an app like keybr.com will allow you to adjust the training level once you start improving. Allocating as little as 15-20 minutes daily to train typing speed can quickly start paying dividends. The end goal is to be able to touch type and reach 80-90 WPM. With that kind of speed, an agent is able to type a response in seconds and handle several simultaneous conversations on live chat with ease (if you don’t have a live chat app, you can test if for 30-days for free). Typing speed is not the only thing that will help you create faster responses and solutions for customers. Another big factor is your ability to organize your work. The more hoops an agent has to jump through when resolving cases, the longer they will take. It should be your top priority to remove these hoops and streamline the whole process. For example, if agents need to get a manager’s approval every time they want to make a refund, it can seriously hamper their ability to help customers. There’s no place for bureaucracy in customer service. Customer service professionals need to be empowered and so that they can handle most cases on their own. Ideally, you want a situation where agents only need to ask for something when a specific case didn’t happen in the past and there’s no set ‘protocol’ for it. That said, when agents need to consult someone, it would be great if they knew who to contact. Everyone should be aware of their teammates’ skills and expertise. For example, a programming question shouldn’t end up with someone specializing in refunds. Tip for managers: Make a habit out of directing specific questions to the right people only. The worst you can do in such situation is to send the question to the whole team. It creates this bystander effect – nobody will want to pick it up because there are other people around that can do it too. The third pillar of fast customer service is proper time management. Every distraction takes away from the precious time you could be spending on helping customers, extending the case resolution time. The key to good time management is removing those distractions. If you constantly find yourself procrastinating on websites like Facebook or Reddit, block them. If your mobile phone distracts you because of texts, notifications and calls, turn it off or place it out of sight and out of reach. Do you think that you’re pretty good at time management and you don’t need to improve anything? Download a time-tracking app and prepare to be surprised. When you start using an app like Rescue Time, you start noticing how much time is wasted on mundane or trivial things like reading company emails. I’d bet good money that there’s at least 30-40 minutes you could save each day by adjusting your schedule. What is the biggest time-eater? Internal communication, hands down. You probably don’t need to read all the emails or Slack messages you get. Most of them is simply addressed to everyone and doesn’t affect you. It’s important to filter those out and only react to messages that affect your work. How do you know that your customer is up to scratch? You need to gather customer feedback whenever possible and keep an eye on the important customer service metrics. The two main ways of gathering feedback are customer surveys and NPS score measurement. You can send a short survey to your customers whenever you solve their problem. You don’t even have to spend a ton of cash on it. You can create a small survey in Google Forms and have the results stored in Google Sheets – both come for free and will allow you to get started. Depending on the answer, the customers are divided into Detractors (0-6, those who will eventually leave), Passives (7-8, customers who won’t leave but also don’t want to promote your business) and Promoters (9-10, customers who will go out of their way to say good things about your services). In the second question of the survey, you simply the user to provide a comment on their scores. This allows you to see what makes promoters like your services and what makes detractors leave. And once you know that, you can do something about it. 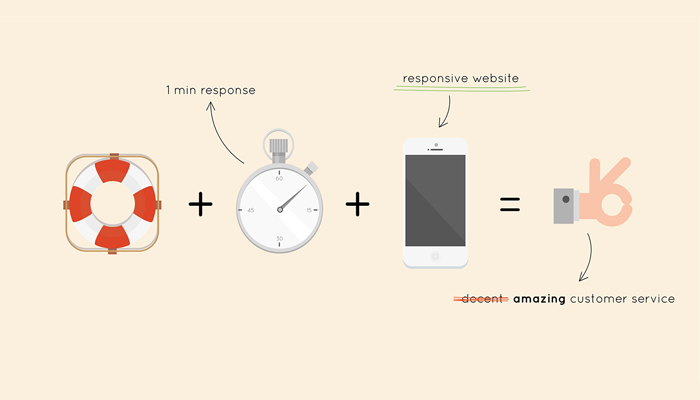 Response time: The speed at which your agents reply to customers, either in live chat or in a ticketing system. The longer customer has to wait for a response, the more agitated they will get and their experience will diminish. 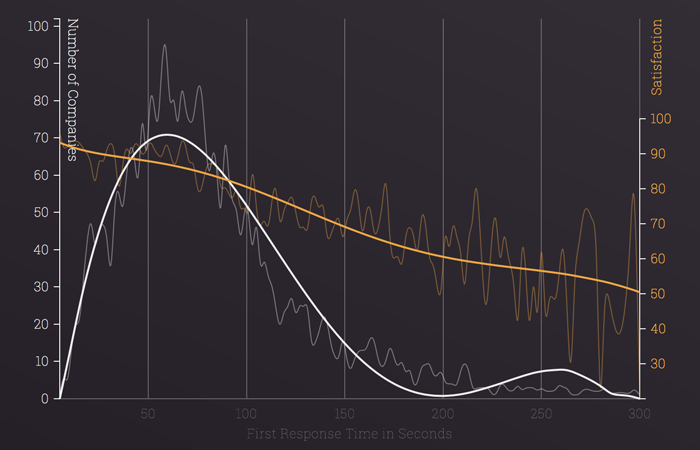 First response time: This metrics deals only with the first reply an agent makes. This is important to track because the first response needs to be much quicker than the average response time. The customer needs to know that the cavalry is coming so answering immediately, even if you don’t have a solution ready, makes sense. Handle time: The average time it takes for an agent to resolve a case. Ultimately, you want to aim for low average handle times but you shouldn’t sacrifice quality for a bit faster resolution. Agents should make sure to answer questions thoroughly before finishing up a conversation. I hope all these methods seem logical to you but it’s always better to see something in action before making a judgment. It’s time to see good customer service in action. I’ve rounded up a few examples of businesses using these methods to create good customer service in their day-to-day interactions with customers. Media Temple is a US-based hosting provider with an amazing customer service recruitment and training process. They are looking for specific traits and skills that are both beneficial when working in customer service and can serve as a foundation to build upon. 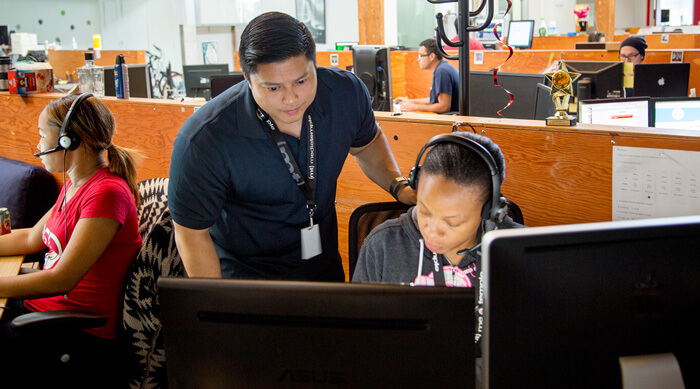 All Media Temple trainees start with a three-week classroom training, during which they learn all the basics of customer service and get to know the company itself. After that, the new agents start helping customers under the watchful eyes of supervisors. The result? Loads of highly-trained, professional agents that bring in amazing customer service results. Way to go Media Temple! Netflix, despite its gazillion customers, is a great example of a business with an amazing customer service response speed. 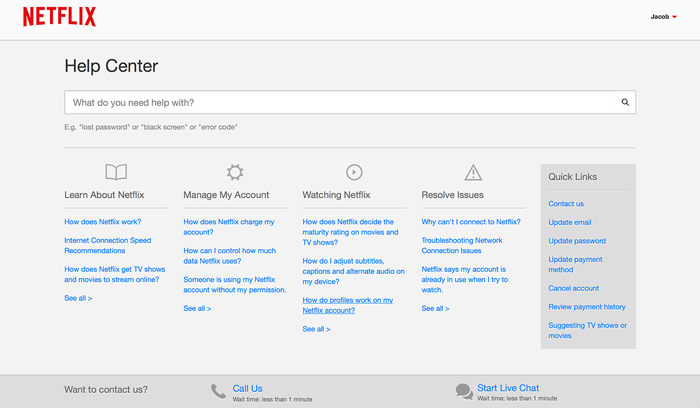 When you reach the Netflix customer service website you get a quick estimate of how long you would need to wait for a phone representative or a live chat agent. What’s amazing is that the are able to constantly keep a response time of less than one minute for both chat and phone, which is really the place you want to be at with your customer service. With a response time like that, customers don’t even have the time to start getting annoyed because they are surprised with a fast reply before they even know it! For a service of this size, it’s really impressive. It’s also something that the competition can’t copy easily, making it a competitive advantage for Netflix. The competition can try to get their hands on an number of movies and dramas Netflix offers, they can undercut them or try to poach their customers but recreating this kind of good customer service won’t be that easy. Added value can help you dominate highly competitive industries where there is not a lot of difference between different products and the ‘extra’ things and services you provide decide which businesses thrive. Amazon customer service is one of the most comprehensive support experiences you can get. And that probably doesn’t come as a surprise if you ever used their services. Their customer service game has always been really strong. However, there are two aspects of Amazon’s customer service that really stand out from the the rest: a really neat and innovative approach to in-app support and the Bezos question mark. Amazon came up with a really cool idea for in-app support. To provide direct access to customer service for their Kindle Fire users, they created the Mayday feature. It’s a button that puts you directly in touch with a support representative. The Mayday support gives users access to immediate customer service, 24/7/365. You can use it at any time of the day and expect to get help within a few minutes. Considering that there’s probably more than 30,000,000 Kindle Fire users around the globe, that’s a tremendous achievement. Another thing that is unique about Amazon customer service is the Bezos questions mark. Jeff Bezos, the CEO of Amazon, has made his email public and encourages customers to write to him if anything Amazon-related goes wrong for them. Anyone can write to him when they think their support case is being handled incorrectly. When Mr Bezos spots a potential problem, he forwards the email to the customer service department with one addition: a question mark. This single question mark makes entire teams drop what they are currently doing to first fix and then explain the situation. How many other companies do you know that put this much stock into good customer service? The best way to see if your approach to customer service works is to answer one simple question: would you like to receive this kind of service yourself? Even though giving a straight answer can sometimes be painful, especially if you have some homework to do, you still should ask this question from time to time. If you answer ‘no’, go back to basics, review what you already have done, keep the ideas that worked and tweak (or get rid of) those that didn’t. If you are able to answer yes (without deluding yourself), you’ve won in good customer service, or rather your customers win and you simply profit from that win. What does good customer service means in your business? What is your take on good customer service? Is your approach similar to the one described in the post or are there any noticeable differences? Feel free to share your experience in the comments as there’s always something new you can learn when it comes to customer service!